Israeli troops carried out predawn detention raids in the occupied West Bank on Sunday, arresting six young Palestinian men, the Palestinian Prisoners’ Society (PPS) said in a statement.Israeli forces detained three Palestinians in the northern West Bank district of Tulkarem, two in the town of Nahhalin in the southern district of Bethlehem, and one near the southern West Bank town of Hebron, the statement said, according to Ma’an. 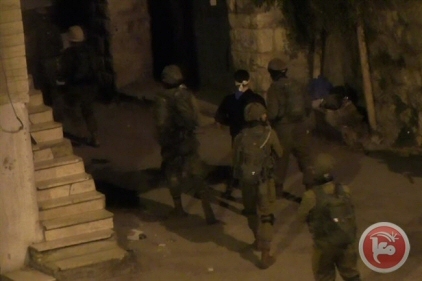 In Tulkarem, Israeli forces abducted Ibrahim Sami al-Akhras and his brother Muhammad, as well as Ali Ayman Jazmawi. The statement identified the Nahhalin detainees as Ahmad Mahmoud Najajra and Nassar Aqil Najajra. Meanwhile, an Israeli soldier took Munif Kamal Amr near Hebron. An Israeli army spokeswoman confirmed the detention of two people in Nahhalin, claiming that they were “suspected of illegal activities.” She did not confirm the other cases in Tulkarem and Hebron. According to WAFA, Israeli armed forces also detained a young Palestinian from the town of Beit Ummar, north of Hebron. Muhammad Awwad, spokesman of the popular committee against settlements in Beit Ummar told WAFA Israeli forces arrested 20-year-old Ayish Ikhlil upon arriving at the Etzion interrogation center north of the town. PPS highlighted that Israeli forces detained 36 Palestinians in the last three days. Israeli forces regularly carry out detention raids across the occupied Palestinian territory, with the UN documenting at least 347 such raids in the last two weeks of December 2015 alone.